Thanks to Joseph Stuby for the crew picture. Picture provided by Joseph Stuby, all rights reserved. 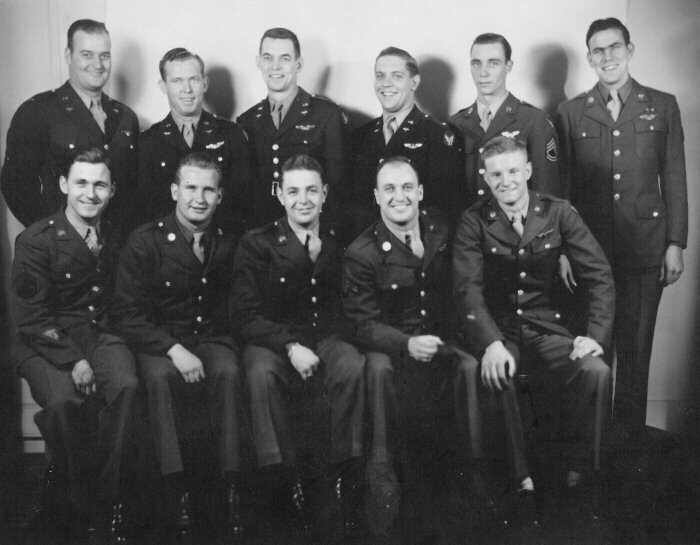 Standing: 1/Lt William C. Grounds (Aircraft Commander), 2/Lt Ollin W. Williams (Pilot), 2/Lt William J. C. Leslie (Navigator), 2/Lt Jack Melvin Hobbie (Bombardier), M/Sgt Neal R. Cooper (Engineer), Sgt Clarence L. Pressgrove (R Gunner). Seated: S/Sgt Arvid A. McPherson (Radio), Sgt Warren Ralph Thompson (T Gunner), Sgt Julian W. Steele (L Gunner), Sgt Harold P. Peterson (Radarman), Sgt Maynor B. Hanks (CFC). For more information on this plane go to Sally Ann's webpage. On Mar 27, the crew flew a night mining mission to Shimonoseki Straits. The airplane was shot down. Fortunately, the entire crew of Lt William C. Grounds was able to bail out. They were captured and imprisoned at the Omori POW camp. All survived the war. This crew generally flew "The Peacemaker".